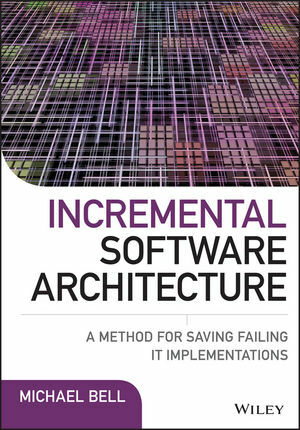 Incremental Software Architecture is a solutions manual for companies with underperforming software systems. With complete guidance and plenty of hands-on instruction, this practical guide shows you how to identify and analyze the root cause of software malfunction, then identify and implement the most powerful remedies to save the system. You'll learn how to avoid developing software systems that are destined to fail, and the methods and practices that help you avoid business losses caused by poorly designed software. Designed to answer the most common questions that arise when software systems negatively impact business performance, this guide details architecture and design best practices for enterprise architecture efforts, and helps you foster the reuse and consolidation of software assets. Relying on the wrong software system puts your company at risk of failing. It's a question of when, not if, something goes catastrophically wrong. This guide shows you how to proactively root out and repair the most likely cause of potential issues, and how to rescue a system that has already begun to go bad. Fierce competition and volatile commerce markets drive companies to invest heavily in the construction of software systems, which strains IT and business budgets and puts immense strain on existing network infrastructure. As technology evolves, these ever-more-complex computing landscapes become more and more expensive and difficult to maintain. Incremental Software Architecture shows you how to revamp the architecture to effectively reduce strain, cost, and the chance of failure. MICHAEL BELL is the founder of Methodologies Corporation, a leading business and technology modeling company offering modern and innovative agile approaches to reduce enterprise expenditure and increase productivity and profitability. His clients have included AIG, Prudential, J.P. Morgan, Chase, Citibank, UBS Paine Webber, American Express, and the U.S. government.